So I've been wondering if AIMP could plug into the media controls of Windows 10 (and I assume Windows 8 and 8.1, but can't test atm). I couldn't find anything about this, so I've been working on an add-on using the C# SDK. The good news is that I've managed to get it working! Right now I'm working on the last few tiny bugs and such, but I'm pretty happy with the result so far! Congratulations! That seems to be a great idea, indeed! Could you please create a video and upload it somewhere to show us more about how this add-on works and what is able to do? Sure, what would you like to see? 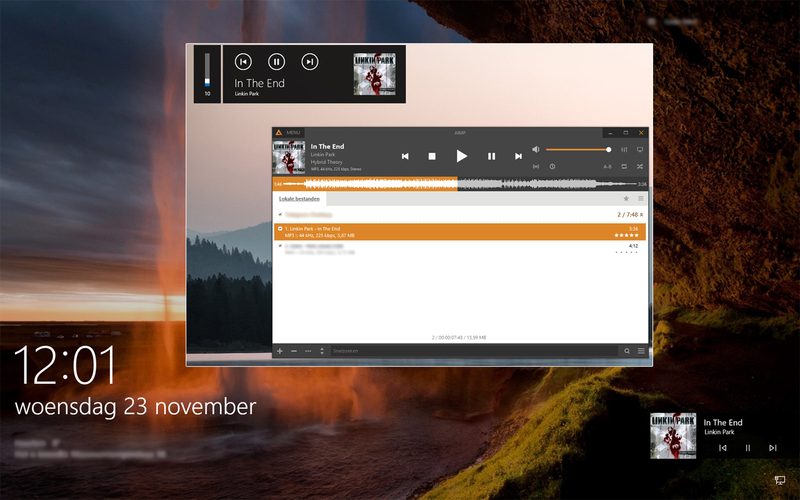 To get an idea on what this does, open an app like Groove on Windows 10 and play some songs. You will see when you press the volume up or down button you get a square in the top-left corner of your screen with the information of the song. The artist, the title and (if available) album art. This is something that's right in the OS. Apps that play media use this to show media that's playing. Usually this is only available in 'modern' apps (or UWP if you want to call them that), but via a little 'hack' I've made it possible to get it working on this plugin. I've got a PM from the use Eyeless and he is going to try if it works on Windows 8.1 as wel. @Eyeless: I can't see the message in my outbox on the forum, so I've sent a mail as well, let me know if you didn't receive it. edit: Just fixed my Release build problem! It should be very useful plugin. I'm waiting for it! Thanks for your interest. Seems like it's a no-go on Windows 8.1 as I expected. But hey, you should be on Windows 10 obviously. I'm trying out the latest beta build, but when I close AIMP I get a "attempt to use an interface of a freed object" error. This is caused by the .Dispose() I call when the plugin is shut down on the aimp player object. If I don't dispose it, I get an error that a little bit of memory is leaked. Is this something I can fix? I don't get any errors in the public build of AIMP. Can you send to me reports from AIMP for both of cases? I've sent a PM with the reports for both errors. Thanks! Hello. Is there any progress in development? No. I haven't used AIMP in months and haven't touched the code. Anything happened with the C# SDK or a new AIMP release? I could send it over for you to use if you want? Are there any updates regarding this? I'd love to see this feature implemented in AIMP. Looks fantastic, I'd love a release to play with.